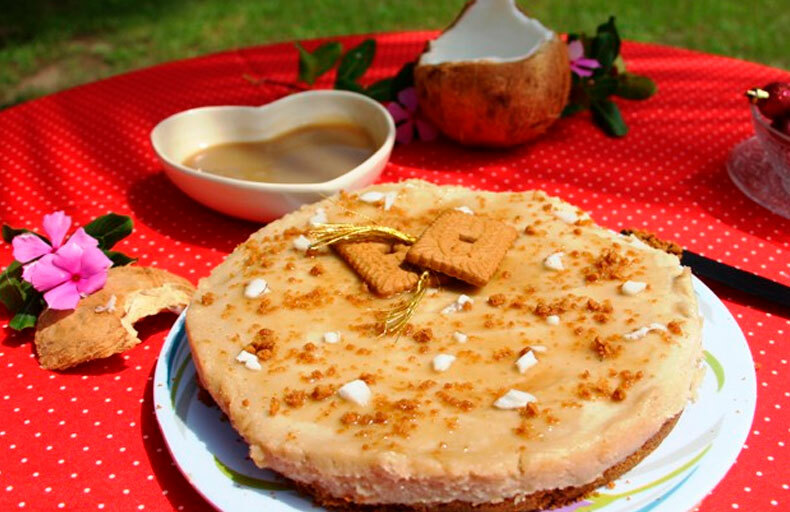 Vegan cheesecake gourmet recipe, Ecomil coconut milk, caramel, cashew nuts and speculos! A culinary shock to seduce all your guests! Crush the speculoos, add the coconut oil, the oilseed puree and mix. In a cake tray (in silicone if possible) , spread the crushed (or coarsely mixed) speculoos to create your pie base. Place in the freezer for an hour. Bring the coconut milk to the boil with the agar agar, mix and cut the fire after one minute. Mix cashew nuts, grated coconut, agarized water and agave (or rice) syrup. Spread the mixed preparation on the background of the speculoos pie. Place again in the freezer for an hour or two, then cool before tasting (it’s better the next day). Pour the sugar and water into a saucepan and bring to a boil. Stir and let brown (this can take about ten minutes). Once the caramel is well cooked and to a good dark color, turn off the heat and add the coconut milk. Switch on low heat, stir and add pre-cooked rice flour: whisk for another 5 minutes, so that the preparation has a good consistency.